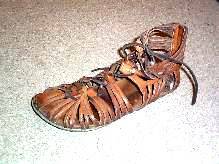 When first looking upon the Caligae, it is difficult to see how such a flimsy piece of footwear could have been so beneficial to the Roman soldier. It does not offer much in the way of protection and does not give the impression of being very sturdy when going over rough terrain. However, as with all things Roman, the design of the caligae was meant to be functional in many ways. The openess of the caligae enabled the soldier to wear them all day, to work, march, stand in them for long periods without discomfort. The leather strips were made so that they did not rub against certain parts fo the feet and so cause sores. When a soldier had been on a march of 25 miles, which was commonplace, he would have aching feet but no blisters. He could remove his caligae and dip his bare feet into the nearest river to cool them off, washing away the aches of the day. He was then refreshed and ready to continue. The underside of the caligae was fitted with studs that the soldier had to buy himself, they were not supplied by the army. Not only would they protect his feet over rough ground, but they also enabled him to use them in battle to stamp on fallen enemy warriors as his unit advanced into the opponent hordes. This was effective as the Roman unit was at least ten rows deep, so any fallen enemy would probably have been severly injured, or dead, soon after falling in front of the Roman advance. By the late 1st century the army began to transition into an enclosed boot called calcei. They offered more protection and warmth than the caligae. They quickly became a staple in both Roman military and civilian dress. Calcei that the whole foot, as distinguished from sandals, or caligae? ? much better in the wet and colder British climate. These calcei generally considered to be a center seamed or laced shoes with the separate inner and outer soles. This GREAT article on calcei is from the The Roman Recruit website and used with the kind permission of the author, Paul Elliott. Please visit Roman Recruit and give it a look! In armies throughout the ages, the marching boot has been a prized possession. Weapons will only be needed in times of war, but the boot is needed every single day. Command sends the soldier into awful terrain on a regular basis, for long periods of time, often to cover very large distances. Earlier legionaries wore the caligae, open sandal-like boots that had thick soles held together with hobnails. From the late 1st century onwards the army began to equip itself with calcei, an enclosed boot more often used by civilian workers. This transition may reflect the fact that more recruits were coming from the northern frontiers, where enclosed boots are of great benefit, or it might reflect changes in the supply system, with legions turning to civilian sources for their footwear. Whatever the reason, calcei were ubiquitous in the British provinces. At Vindolanda the wet conditions have preserved many examples of Roman footwear, civilian and military, adult and child. A great proportion (of all types) have hobnails hammered into the soles, a technique which binds the thick soles strongly together, which reduces wear and tear, and which gives an excellent grip akin to wearing modern football boots! Boots made by Paul Elliott, they lasted three years and were used on two cross-country marches before coming apart! They are greatly missed! 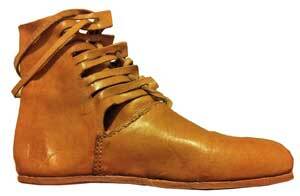 Each calcei was made up of three major parts, an insole and an outer sole as well as one large upper. The flexible leather upper was curved around and then whip-stitched to the insole. 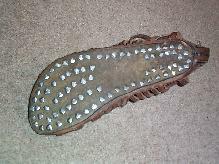 After this, the outer sole was placed onto the bottom of the boot and hobnails were then hammered into the outer sole and bent over to bind the three pieces of leather together. Individual calcei have been found that are held together with more than a hundred hobnails! The upper part of each boot is brought together and stitched up the front and again up the heel. There are other stages, too, such as building up a heel with extra layers of leather between the soles (no Roman boot has an exterior heel), and inserting internal toe and heel strengtheners. 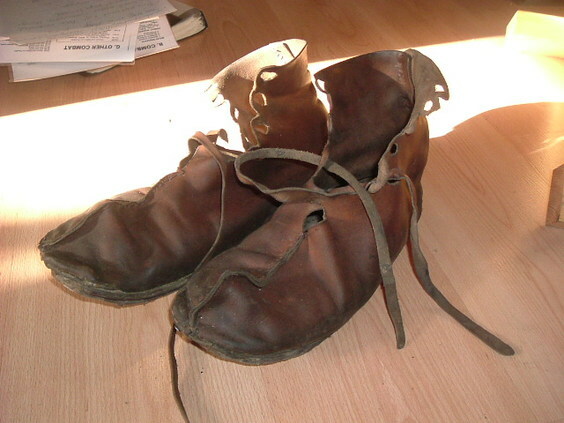 Above: Boots worn today by Fortunatus. They are made by Sarah Juniper and based on an example found at Vindolanda. "...he was wearing the ordinary military boots studded with masses of sharp nails, and as he ran across the pavement he slipped and fell flat on his back, his armour clanging so loudly that the runaways turned to look. His men were too terrified to go to the rescue, and so: "the Jews crowded round him and aimed blows from all directions with their spears and swords ... Even then as he lay he stabbed many with his sword;...but at last, when all his limbs were slashed and no one dared come to his aid, he ceased to struggle." 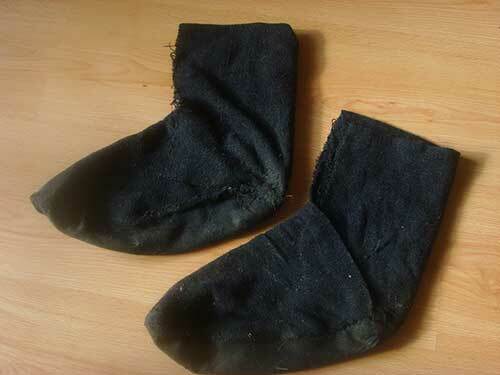 Above: Socks made of woollen fabric sewn together. These are based on an original sock found and manufactured in the same way found in the 3rd century deposits at Vindolanda fort: Below.